New patient visits at The Hill Hear Better Clinic typically last 60-90 minutes. During this time, we want to hear your story– to learn more about your history, daily lifestyle and personal hearing needs so we can find the best solution for you. We will also conduct a comprehensive hearing evaluation using the most advanced technology and equipment available. During your examination, we will walk you through every step of our process so you understand the purpose of each test, what you will see and feel during testing and understand what we are looking at on screen. After your evaluation, we will thoroughly explain your results and our treatment recommendations. And, if your hearing needs are beyond the care we provide, we are happy to refer you to another expert. 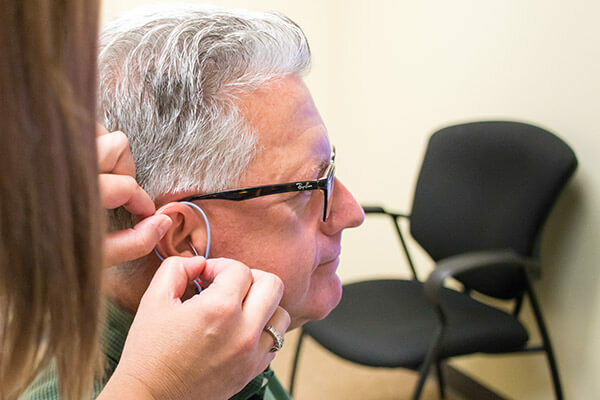 We have strong relationships with area medical professionals, including ENTs, to address hearing issues such as acoustic neuromas, cochlear implants and more. Our mission is to help you with your hearing needs, so please let us know what we can do for you.